First Minister Alex Salmond and Chris Fujiwara, Artistic Director, Edinburgh International Film Festival, have announced that the much anticipated Disney-Pixar animated film “Brave”, which is set in mythical Scotland and features some of the UK’s best-loved stars, will receive a glittering European premiere in Edinburgh, on the closing night of the 66th Edinburgh International Film Festival. The red carpet will be rolled out at the Edinburgh Festival Theatre for a host of stars and filmmakers on 30th June when the animated tale of a courageous Scottish heroine is unveiled. The First Minister made the announcement about the premiere during his speech at VisitScotland’s Winning Years Conference in Perth today. Mr Salmond told an audience of tourism specialists, operators and business people assembled to discuss how they could maximise promotional activity by focusing on major events and milestones in the next few years: “I am delighted to announce that Hollywood will roll into town during the Edinburgh International Film Festival when we host the European premiere of “Brave”. This will present us with an immense opportunity when Scotland will be centre stage in the film with all the tourism and business opportunities this will bring. I fully expect that as the film launches across the world, so will awareness of Scotland increase. 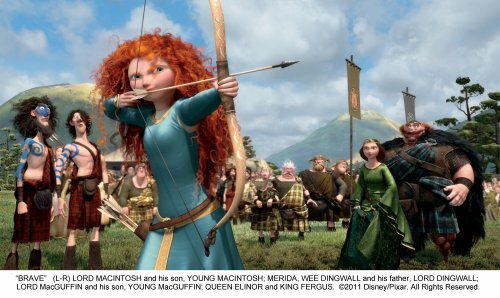 The announcement comes just days after VisitScotland revealed it had joined forces with Disney-Pixar in a campaign which is designed to promote Scottish tourism across the world and bring a boost to the Scottish economy. The premiere will provide a showpiece finale for the Edinburgh International Film Festival and will set the scene for the UK launch of the movie in August. Mr Salmond continued: “Brave will be the most high-profile film ever set in, and themed around, Scotland, featuring Scottish stars. We are looking at a film which comes from the award-winning team behind such box office smashes as Toy Story, Finding Nemo and Up, and will create global buzz when it is released. The Winning Years conference brought together tourism industry representatives to consider opportunities being presented by a number of world scale events taking place in Scotland during 2012 to 2014. The First Minister added: “The Winning Years offer an unprecedented opportunity for Scotland to grow tourism, stimulate the economy and position itself on the global stage.